Baculoviruses are pathogens that attack insects and other arthropods. 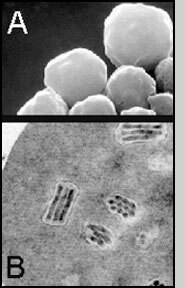 Like some human viruses, they are usually extremely small (less than a thousandth of a millimeter across), and are composed primarily of double-stranded DNA that codes for genes needed for virus establishment and reproduction. Because this genetic material is easily destroyed by exposure to sunlight or by conditions in the host's gut, an infective baculovirus particle (virion) is protected by protein coat called a polyhedron (plural polyhedra: see Figs. A, B, and C). Most insect baculoviruses must be eaten by the host to produce an infection, which is typically fatal to the insect. The majority of baculoviruses used as biological control agents are in the genus Nucleopolyhedrovirus, so "baculovirus" or "virus" will hereafter refer to nucleopolyhedroviruses. These viruses are excellent candidates for species-specific, narrow spectrum insecticidal applications. They have been shown to have no negative impacts on plants, mammals, birds, fish, or even on non-target insects. This is especially desirable when beneficial insects are being conserved to aid in an overall IPM program, or when an ecologically sensitive area is being treated. The USDA Forest Service currently uses the gypsy moth nuclear polyhedrosis virus (LdNPV) to aerially spray thousands of acres of forest each year. This product, registered as Gypchek, is effective against gypsy moths but leaves all other animals unharmed (Reardon et al. 1996). On the other hand, the high specificity of baculoviruses is also cited as a weakness for agricultural uses, since growers may want one product to use against a variety of pests. Currently, researchers are attempting to use genetic engineering techniques to expand virus host ranges to the desired pest species. Releases of such genetically-engineered baculoviruses have been made by researchers in the U.K. and the United States and show promise, although the cost of commercial production of these agents must be reduced if they are to be competitive. Companies like Dupont, biosys, American Cyanamid, and Agrivirion (to name a few) have continued to explore the expansion and development of agricultural-use viral insecticides. Recently, biosys has released two baculovirus-based products, Spod-X for beet armyworm and Gemstar LC for tobacco budworm and cotton bollworm. Viruses are unable to reproduce without a host - they are obligate parasites. Baculoviruses are no exception. 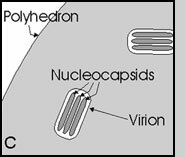 The cells of the host's body are taken over by the genetic message carried within each virion (Fig. C), and forced to produce more virus particles until the cell, and ultimately the insect, dies. Most baculoviruses cause the host insect to die in a way that will maximize the chance that other insects will come in contact with the virus and become infected in turn (above and Fig. D). As seen in the animation on the right, infection by baculovirus begins when an insect eats virus particles on a plant - perhaps from a sprayed treatment. The infected insect dies and "melts" or falls apart on foliage, releasing more virus. This additional infective material can infect more insects, continuing the cycle. It is widely acknowledged that baculoviruses can be as effective as chemical pesticides in controlling specific insect pests. However, the expense of treating a hectare of land with a baculovirus product invariably costs more than an equally efficacious chemical treament. This difference in price is due primarily to the labor intensive nature of baculovirus production. Some viruses can be produced in vitro (within cell cultures in the laboratory, not requiring whole, living insects). These are less expensive than those that can only be produced in vivo, that is, inside of living insects. The cost of rearing live hosts adds greatly to the final cost of the product. It is to be hoped that insect cell culture systems currently being developed for other uses may ultimately make viral pesticides more cost-effective. Insects killed by baculoviruses have a characteristic shiny-oily appearance, and are often seen hanging limply from vegetation (Fig.E). They are extremely fragile to the touch, rupturing to release fluid filled with infective virus particles. This tendency to remain attached to foliage and then rupture is an important aspect of the virus life-cycle. As discussed above, infection of other insects will only occur if they eat foliage that has been contaminated by virus-killed larvae. It is interesting to note that most baculoviruses, unlike many other viruses, can be seen with a light microscope. The polyhedra of many viruses look like clear, irregular crystals of salt or sand when viewed at 400x or 1000x. The fluid inside a dead insect is composed largely of virus polyhedra - many billions are produced inside of one cadaver. Baculoviruses can be found wherever insects exist. Because rain and wind readily carry baculoviruses from place to place, it is likely that every piece of land and body of water contains some virus particles. It is widely accepted by researchers that most produce currently on the shelves is "contaminated" by baculovirus particles (Heimpel et al., 1973). In fact, the pervasiveness of baculovirus particles, along with the results of tests performed in conjunction with registration, may be considered both indirect and direct evidence for the safety of these agents. Like most viruses, baculoviruses tend to be species or genus specific, although there are some exceptions to this rule, notably the Autographa californica nuclear polyhedrosis virus. Much of the genetics work currently being done to improve baculovirus-based pesticides is concentrated in the area of the virus genome controlling its host range. Below is a list of currently registered baculovirus products as of October 1997. The numbers underneath the virus product name refer to TABLE 2, the list of suppliers. If you would like to get a current list from the EPA, they have an excellent Web site at http://www.cdpr.ca.gov/docs/pestmgt/ipminov/bensuppl.htm. Go to their page, and in the field labeled PC Code # or Name type the word "virus", and press [Submit Query]. Although a few of the products found will be unrelated to insect control, it's quite clear which are registered for use as insecticides. *These products are not produced or registered in the U.S. at the present time. Viruses particles per se are generally unaffected by pesticides, although some chlorine compounds should be expected to damage or destroy viruses if applied at the same time. Baculovirus efficacy, however, can be altered in many ways by the effects of chemical pesticides on the host insect. A review by Jacques and Morris (1981) showed that of 10 pesticide-virus combinations, 9 resulted in an additive effect on insect mortality. However, some of the pesticides included in that review have since been banned, and this study is of limited use at present. More work is needed to explore the effectiveness of insecticide "cocktails" consisting of enviromentally friendly chemical agents and baculoviruses. A list of suppliers for baculovirus-based products can be found below. 4. Novartis Crop Protection, Inc.
SPECIAL NOTE: A new book, Insect Viruses and Pest Management, is due out March 1998. John Wiley & Sons, ISBN #0-306-43406-7. Burges, H. D. [ed.] 1981. Microbial Control of Pests and Plant Diseases. Academic Press, London UK. Granados, R. R. and B. A. Federici [eds.] 1986. The Biology of Baculoviruses. CRC Press, Inc., Boca Raton, Florida. Heimpel, A. M., Thomas, E. D., Adams, J. R. and L. J. Smith. 1973. The presence of nuclear polyhedrosis virus of Trichoplusia ni on cabbage from the market shelf. Environ. Ent., 2:72-76. Jacques, R. P. and O. N. Morris. 1981. Compatibility of pathogens with other methods of pest control and crop protection. In Microbial Control of Pests and Plant Diseases, Burges, H. D. [ed.] Academic Press, London UK. Maramorosch, K. and K. E. Sherman [eds.] 1985. Viral Insecticides for Biological Control. Academic Press, Orlando Florida. Reardon, R. , Podgwaite, J. P. and R. T. Zerillo.1996. GYPCHEK - The gypsy moth nucleopolyhedrosis virus product. USDA Forest Service publication FHTET-96-16. Feel free to contact Dr. Vince D'Amico for more information. Figs. A) Baculovirus particles, or polyhedra; B) Cross-section of a polyhedron; C) Diagram of polyhedron cross-section. Electron micrographs (A&B) by Jean Adams, graphic © by V. D'Amico.